In einem vergoldeten Rahmen im Renaissance-Stil. Beigegeben Thermolumineszenz-Dokumentation vom 10.09.2015 (ART-Test Firenze). 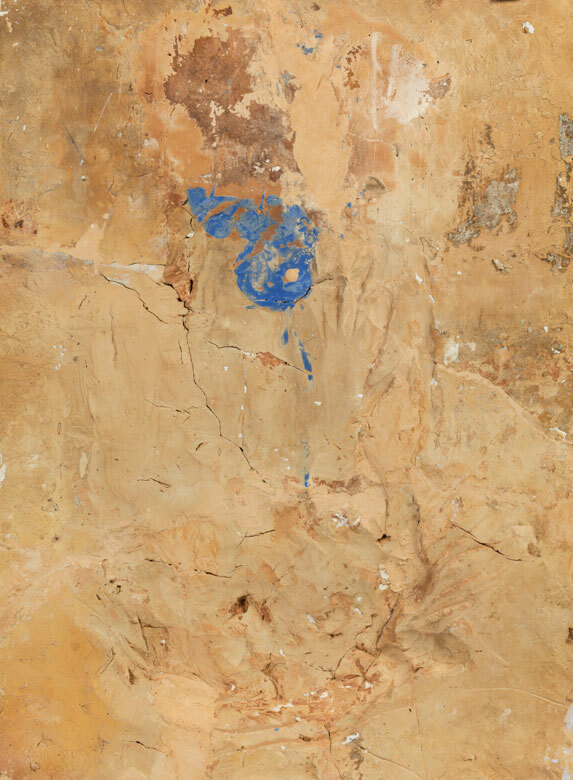 Die hochrechteckige Platte zweifarbig glasiert, der Hintergrund blau, Büste und Wappen weiß. Die Büste nach links gewandt, in Chormantel mit Papstkrone, die Wandbordüre und Huteinfassung geometrisch im Relief gemustert. Der dargstellte Papst Martin V, vor seiner Papstwahl Oddo di Colonna (1368-1431), gilt bis heute als bedeutende Persönlichkeit der römischen Kirche. 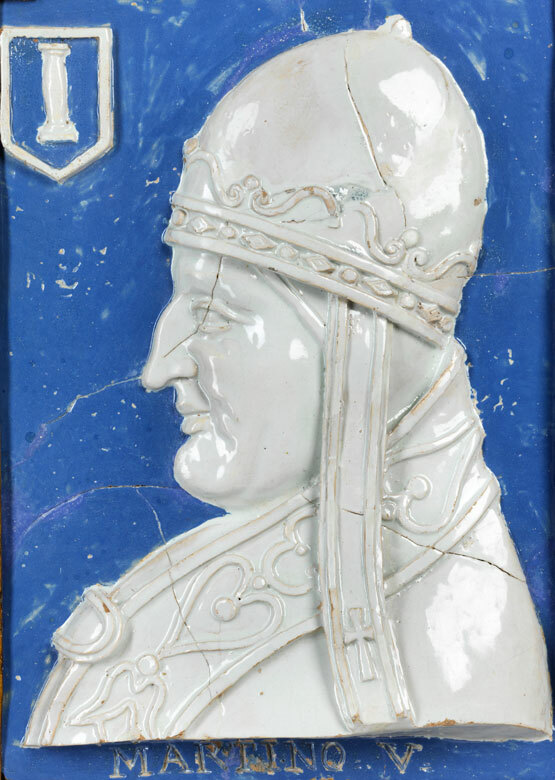 Er stammte aus dem Hause der Conti, war Sohn von Agapito Colonna, weswegen sein Wappen links oben eine Säule aufweist. Seine Kirchenpolitische Bedeutung liegt darin, dass er 1417 das Abendländische Schisma auf dem Konstanzer Konzil beendet hatte. In gilt frame in Renaissance style. Accompanied by a thermoluminescence report from 10 September 2015 by ART-Test, Florence. 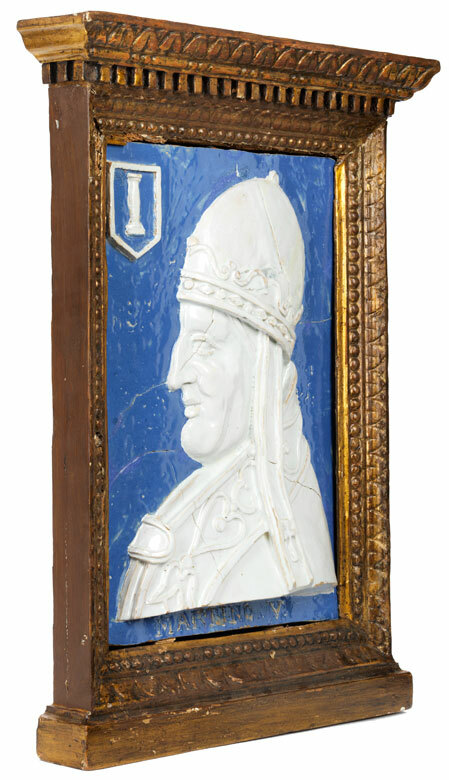 The portrait format panel is glazed in two colours – the background in blue, the bust and coat of arms in white. 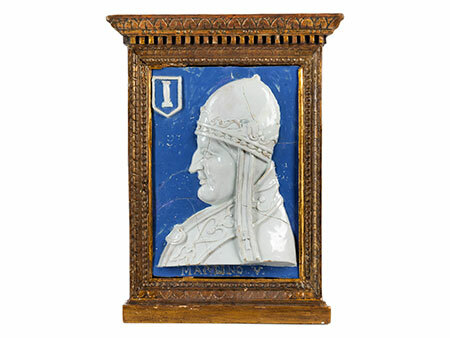 The bust is turned left, dressed in cope and papal crown, the wall's edging and crown's trimming with geometrical relief ornaments. The depicted Pope Martin V, known as Otto di Colonna (1368 – 1731) before his papal election, is today regarded as an important figure of Catholic church history. He descended from the House of Conti and was the son of Agapito Colonna , which is why this coat of arms appears on the column in the top left. His great church political achievement was to end the Western Schism at the Council of Constance in 1417. 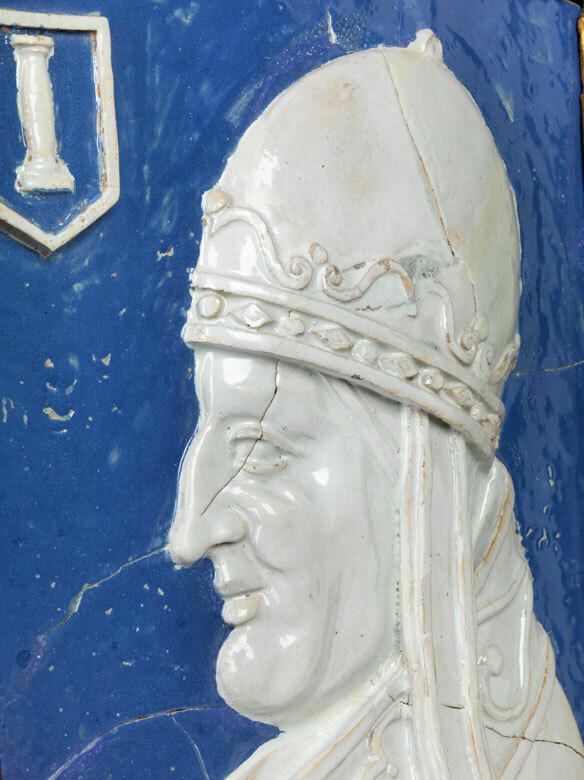 The relief panel is created in the typical tradition of the della Robbia workshop with respective glaze colours. Undamaged, however with several visible shrinkage cracks. Compare Illustrated catalogue of Gothic and Renaissance Italian and French Art, The Tolentino Collection, Auktionskatalog the American Art Galleries, April 1924, New York 1924. 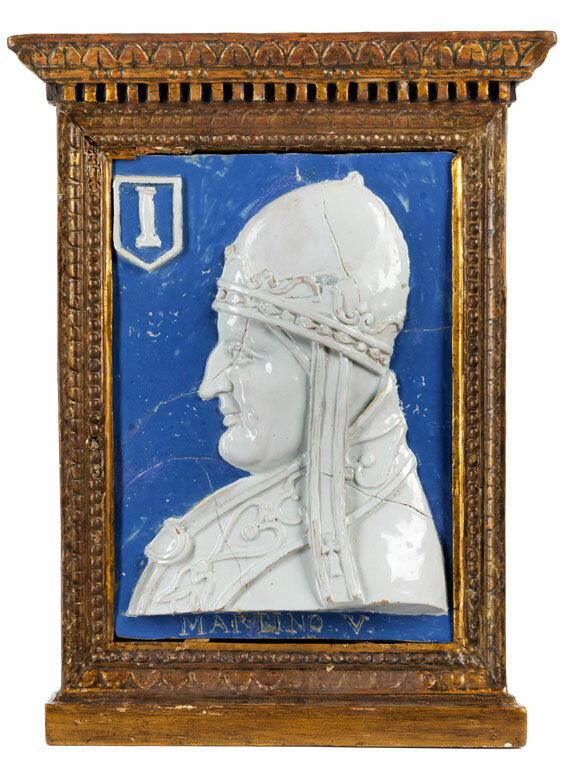 Here attributed to Luca della Robbia.